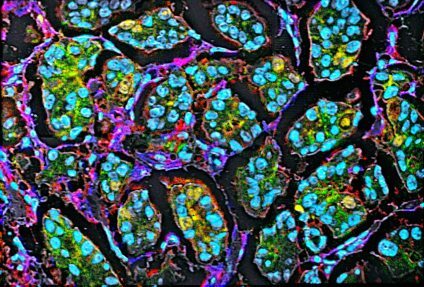 The artistic masterpiece above, reminiscent of a stained glass window, is the work of Michael Angelo—no, not the famous 16th Century Italian artist, but a 21st Century physician-scientist who&rsquo;s out to develop a better way of looking at what&rsquo;s going on inside solid tumors. Called multiplexed ion beam imaging (MIBI), Angelo&rsquo;s experimental method may someday give clinicians the power to analyze up to 100 different proteins in a single tumor sample. In this image, Angelo used MIBI to analyze a human breast tumor sample for nine proteins simultaneously—each protein stained with an antibody tagged with a metal reporter. Six of the nine proteins are illustrated here.&nbsp;The subpopulation of cells that are positive for three proteins often used to guide breast cancer treatment (estrogen receptor a, progesterone receptor, Ki-67) have yellow nuclei, while aqua marks the nuclei of another group of cells that&rsquo;s positive for only two of the proteins (estrogen receptor a, progesterone receptor). In the membrane and cytoplasmic regions of the cell, red indicates actin, blue indicates vimentin, which is a protein associated with highly aggressive tumors, and the green is E-cadherin, which is expressed at lower levels in rapidly growing tumors than in less aggressive ones. Taken together, such “multi-dimensional&rdquo; information on the types and amounts of proteins in a patient&rsquo;s tumor sample may give oncologists a clearer idea of how quickly that tumor is growing and which types of treatments may work best for that particular patient.